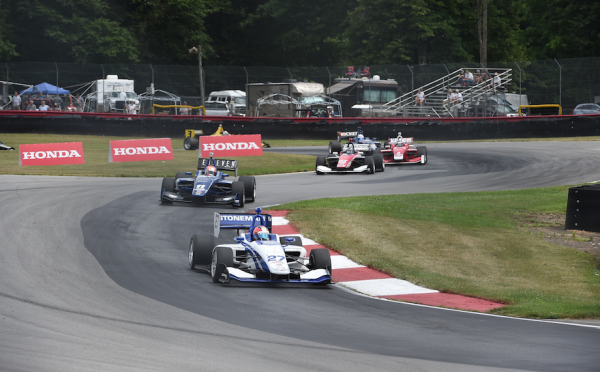 Indy Lights Presented by Cooper Tires, Mid Ohio, USA, 30th July 2016 Race 1Dean Stoneman strengthened his championship hopes with another impressive podium for 3rd place in one of his most physically demanding races of the season so far. The Andretti driver had to work hard for his points having started from 4th on and a twisting track, which he had never raced on before. Despite this, from the start the 26 year old looked racey as he looked for a way through the field to the front. Stoneman saw a chance to go around the outside of the two cars ahead of him and he seized the opportunity in a brave move to shift up to 3rd and ahead of two of his championship rivals, including the championship leader. Stoneman was to come under pressure a couple of times as the race went on, but with the championship no doubt on his mind the Southampton driver was in no mood to miss out on his 6thpodium of the season. But as the 30 lap race came to an end Rookie Stonemam finished just over a second behind 2nd the car ahead and with it more valuable championship points. After the race Stoneman commented, “ That was tough! It’s one of the most physically demanding tracks I’ve raced at for a while. I know we needed to have a strong day today to keep up with the leading guys in this championship and we achieved that. At the start it was a real battle for the lead, but the circuit is narrow and I had little space or options. It was good to make a move to get up to 3rd, although Serralles behind kept me honest for the rest of the race. Dean Stoneman has been awarded 7 championship points from Toronto after his car failed to start before the race following a fuel contamination issue.